I switched out the standard joystick it came with for a PS4 non domed stick and put on a Kontrol Freak Omni, feels great. Finally managed to mess around with my dead zones and joystick angles last night based on advice here and its awesome. This is a great and very helpful community. This was the one I bought, but there are others. Done and done! Thanks for the idea! Hey guys i play apex legends about to start playing alot does anyone know the deadzones and stuff that are good for joystick mode?? Just curious i got it set to 20 and 350 deadzone. Im not very handy at all this deadzone talk thats why im asking ive been reading and it seems like u all got it figured out any help would be much appreciated. My buttons double clicked on fortnite do u guys think 100 ms would be ideal? Not sure about the activation delay, you'll have to experiment with that. Regarding the deadzone, if you feel you reach max speed fast enough, you can leave the deadzone as it is, but if you feel like it take too long to reach max speed, lower the deadzone to like 250, so that you are at the max input level earlier in your stick travel. I ended up using the smallest stick but I prefer a rounded top, so I stuck a little blob of Sugru on to get the round top. It's nice to have options for stick length if you are moving the stick housing adjustment position about while looking to find the setting that feels right for your hand. I tried using the shortest stick, but it was so short that the underside of the stick rubbed against the housing when I push it to its maximum distance. I might have to just file off the underside of the short stick. I also googled if I could buy the domed stick but shorter, but surprisingly I could not find that. That's odd, never had that problem with the shortest one in the set I bought. What about reducing the upper dead zone a bit more so that the stick doesn't travel so far? I had a play about with the Azeron software yesterday and reduced my upper dead zone from 350 to 280. I also put the middle sized stick back in to try it out, and it makes the stick feel really light and effortless with the reduced dead zone ... liking it. So my problem is not necessarily the deadzones. I think i have 200 max anyway. But I usually move the stick to its max distance no matter the deadzones and I feel the underside of the short stick rub against the housing at its furthest point and if I give it a bit more pressure, it kind of levers the stick a bit out of the socket. 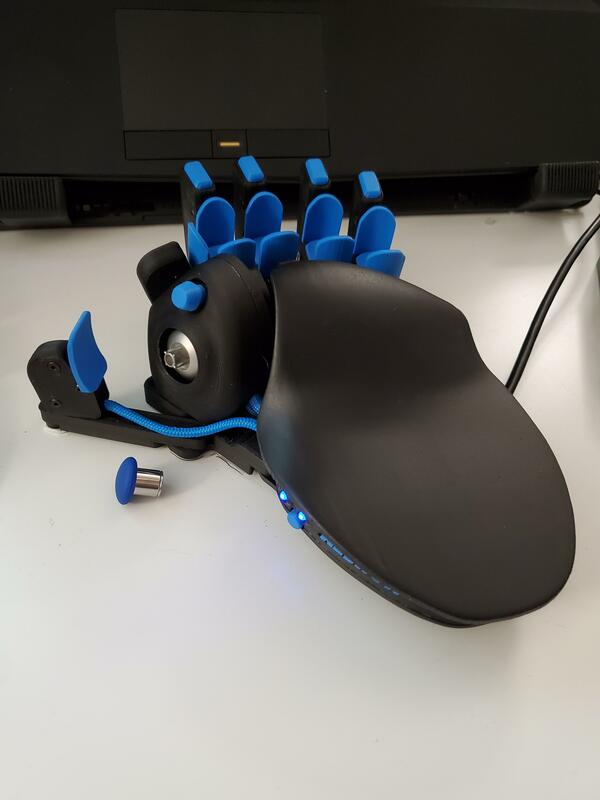 I will try to file the underside of the short thumbstick a bit so I have a larger margin between thumbstick and housing and see if that works. Honestly the most ideal stick would be the domed version and a height of halfway between the short convex and medium domed one. The medium domed one feels really good but is just a smidge too long so I feel like I lose a little bit of time having to move the stick a further distance going back and forth. Really surprised that you can't buy it anywhere. There are so many copies of the xbox elite magnetic thumbsticks but they all copied the originals one to one instead of providing different lenghts and tops. So yesterday I played 3 hours using just a regular PS4 dualshock controller. Man my hands hurt so bad! And my aim was off like nobody's business. I think I'll be sticking to the azeron and mouse from now on except for casual play and vehicles. The handcramps were pretty much unbearable, I don't know how I did it before. Does anybody here know if it's possible to do a macro on the G502 that incorporates a button from the azeron gamepad? What I have in mind is making the macro do a quick double tap of a button that is assigned to the azeron. I know I could just assign the button to the mouse and do it that way but, I want it on the azeron pad as well.